I'm Steve Nelson. 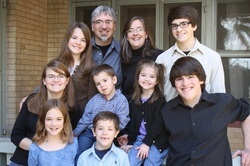 My wife Kathleen and I have eight kids spanning fifteen years! I am a pastor at The Rio Community Church in El Paso, TX, and Kathleen stays home and manages the kiddos. Five years ago we moved to Texas from Colorado to help start a church. Our kids are Blaise (19), Hope (17), Silas (15), Kez (13), Malia (11), Jireh (9), Jaza (6), and Zerub(4). Our desire is to build strong disciples by building strong families. In doing so, we hope to provide parents with support to help equip them to raise godly men and women. If you would like to find out more about our ministry, please visit BtoZ Parenting. Feel free to contact us if you have any questions about us or our ministry.